Back by popular demand! The Fireshed Coalition is hosting a second showing of Era of Megafires during Wildfire Preparedness week. The last showing was 100 percent sold out. Join us on May 1st at 6:00 pm for a showing of the film followed by a panel discussion. Tickets are $8 and will be available for purchase on the Jean Cocteau website in early-April. 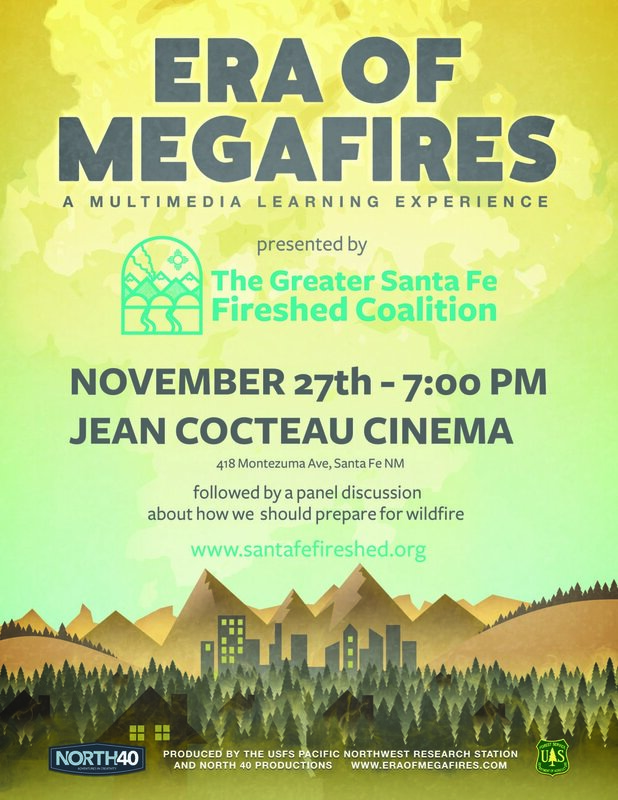 The movie will be followed by a panel discussion with local experts to talk about the risk of wildfire here in Santa Fe, the impacts fire could have and what the Santa Fe Fireshed Coalition partners are doing to prepare. While the movie was produced in the Northwest, it still is very applicable to the Southwest. You can get a feel for the hour-long movie by watching this shorter 15-minute TED talk beforehand. The rise of highly destructive megafires -- wildfires over 100,000 acres -- has become one of today's most pressing and complex problems, threatening our communities, homes, businesses and even our very way of life. Facing the reality of this issue is daunting, but like all wicked problems, through education and action we can change the way fire comes to our forests and communities. The Era of Megafires is a 60-minute multi-media presentation that combines the research of Dr. Paul Hessburg (Pacific Northwest Research Station, U.S. Forest Service) with the visual storytelling of award-winning film company, North 40 Productions. It’s presented in the form of fast-moving, short, topic-based talks interspersed with compelling video vignettes and animations. Join the Santa Fe Fireshed Coalition for a workshop based on the recent report "A Statement of Common Ground Regarding the Role of Wildfire in Forested Landscapes of the Western United States". The workshop will closely examine the report with the expertise of one of the co-investigators, Craig Allen, as well as scientists Tom Swetnam, Ellis Margolis, Jens Stevens, and Matt Hurteau. Group conversation will be facilitated by former city council member and Santa Fe community leader, Rosemary Romero. The working group who produced this report sought to identify, and partly explain, areas of scientific common ground and divergence among fire researchers, focusing specifically on dry conifer forests, in support of informing high-quality public discourse, policy, and management. The workshop will address similar issues among researchers and land managers specific to the Santa Fe area. Stay tuned for a half-day agenda that will include group dialogue and interactive break out sessions. The Pajarito Environmental Education Center (PEEC) invites you to a free presentation on the community’s role in forest restoration. PEEC will host District Ranger Sandy Hurlocker and forester David Gilmore, both from the Española Ranger District of the Santa Fe National Forest, on Thursday, Feb. 28, at 7 p.m. at the Los Alamos Nature Center. Hurlocker will provide the “big picture,” a status on landscape-scale efforts to improve the forest’s resilience to major disturbances, including wildfire, insects and disease, and climate change. Gilmore will address one specific piece of the restoration strategy – planting trees – and how communities can play a productive role in large-scale projects. For more information on this event, visit the PEEC website at https://peecnature.org/events/details/?id=28935. Are you interested in learning about Forestry Projects, Management Plans, and Legacy Planning? If so, consider joining the Forest Stewards Guild and our Fireshed Coalition partners at State Forestry and Chama Peak Land Alliance for a Women Owning Woodlands workshop on February 1st at the Upper Chama Soil & Water Conservation District office across from the Post Office in Tierra Amarilla. Registration is $10 and includes lunch. Please bring hiking shoes, water and warm clothes. Part of the day will be outside. Stick around after the workshop for a social with Chama Peak Land Alliance at the same location from 5:30 to 8:00. Claudia Reynoso, a local Environmental Science teacher at Escalante High School, will give a presentation on Environmental Education. The Española and Pecos/Las Vegas Ranger Districts of the Santa Fe National Forest are developing a proposed action for the Santa Fe Mountains Landscape Resiliency Project. The project area consists of approximately 50,000 acres of National Forest System lands located east of the City of Santa Fe. Other nearby communities include Chupadero, Tesuque Village, La Cueva, Cañada de los Alamos, Tesuque Pueblo, Glorieta, Pojoaque Pueblo, and Nambe Pueblo. The project area is part of a priority landscape referred to as the ‘Greater Santa Fe Fireshed’ or ‘Fireshed’. The Fireshed is a 107,000-acre landscape located along the Santa Fe Mountains in the southern Sangre de Cristo Mountain Range. Across several fire protection jurisdictions, local forest, and fire and water managers agree that after more than a century of fire exclusion, the Fireshed is at risk of large, high-severity wildfire, post-fire flooding and debris flow. An open house-style public meeting to share information about the Santa Fe Mountains Landscape Resiliency Project will be held at the Santa Fe National Forest Supervisor’s Office at 11 Forest Lane, Santa Fe, NM, on Thursday, December 13 from 4:00 p.m. to 6:30 pm. Attendees are welcome to "come and go" at their leisure during the open house. Forest personnel want to engage with individuals and organizations in the early stages of the planning process for the project. Input is needed from a variety of perspectives to help USDA Forest Service staff refine a proposal that considers the interests of the stakeholders who use and value the landscape. USDA Forest Service staff will be available to discuss the existing conditions of resources in the project area and the types of activities that may be proposed to address resource concerns. Contact Hannah Bergemann, Fireshed Coordinator at hannahbergemann@fs.fed.us or (505) 438-5448 for more information. You may also visit the Forest projects page at https://www.fs.usda.gov/projects/santafe/landmanagement/projects. Presented by the Greater Santa Fe Fireshed Coalition. Join the Coalition on November 27th at 7pm for a screening of the Era Of Megafires and a panel discussion following the film. Come a little early to grab a drink at the Conservation Cocktails reception at the Jean Cocteau with Fireshed partners and friends. Tickets cost $8. This will help cover the licensing fees and the venue fees. You can buy them at the door, or online here. The Panel will be facilitated by Kendal Martel (FSG). While the movie was produced in the Northwest, it still is very applicable to the Southwest. You can get a feel for the hour-long movie by watching this shorter 15-minute TED talk beforehand. Coordinated by the Southwest Fire Science Consortium. Wildland fire is a pervasive disturbance agent on the Gila NF and beyond. Consequently, understanding those factors that drive historic and contemporary fire regimes provides insight as to what we might expect in future decades as the climate continues to warm. In this presentation, I will discuss a few studies that have been recently completed or are currently underway. The first pertains to an evaluation of the drivers and distribution of high-severity fire; I will highlight the corresponding geospatial maps that predict the probability of high-severity fire in your area and discuss how these maps can be used for planning purposes. I will also showcase a study that evaluated potential climate-induced changes in fire regime characteristics and vegetation types; this study suggests that some areas currently forested in New Mexico will convert to non-forest in future decades. Lastly, I will discuss the potential for fire-facilitated conversion from forest to non-forest in New Mexico and beyond. I look forward to sharing my research, hearing your feedback, discussing ways to improve future research efforts. What drives low-severity fire in the Southwestern USA? The Greater Santa Fe Fireshed Coalition is hosting a learning exchange into the Hyde Park Project on Saturday, August 11th. The hiking tour will start at 9:00 am at the Black Canyon day use parking lot and will end at 12:00. The hiking tour will include stops to view thinning and burning sites in the watershed and the Hyde Park pile burn area. The hike is 2 miles in moderate terrain. Industry professionals will speak about the project overview, impacts on wildlife and pollinators and prescribed fire use. This event is free and open to the public. Join the Greater Santa Fe Fireshed Coaltion for a free community meeting on Monday, July 9, at Santa Fe Indian School, in the Francis Abeyta Building, beginning at 5:30 pm. Presentations will include professionals from The Nature Conservancy and the U.S. Geological Survey. The last half-hour of the evening is reserved to address your questions. The topic of the meeting is fire history in the Greater Santa Fe Fireshed, a Fireshed Assessment of wildfire risk, and a strategy for mitigating the wildfire risk across the landscape. To prepare for the meeting, take a look at the recently completed Risk Assessment. Come ten minutes early to park and find your way into the building. Join the Greater Santa Fe Fireshed Coalition on June 6th for a public community meeting about wildfire season and what you can do to prepare. The Greater Santa Fe Fireshed Coalition invites YOU to be a Fireshed Ambassador! Join us on May 16th to learn more about the program and how to get involved. The Greater Santa Fe Fireshed Coalition is finalizing a strategy for forest restoration in the Southern Sangre de Cristos, including the Village of Tesuque and surrounding areas. 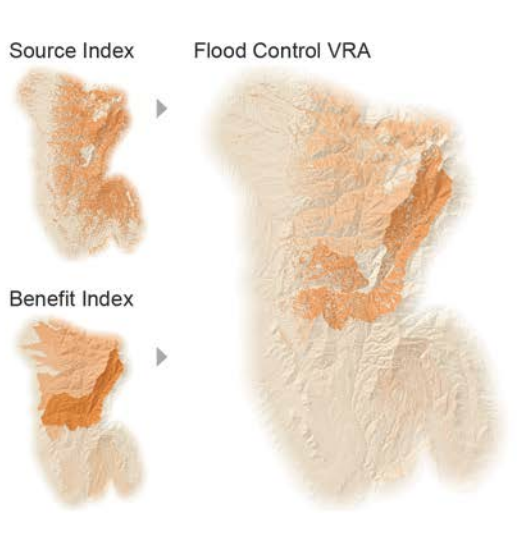 The core of the strategy is a model for analyzing different levels of wildfire risk across the landscape, which takes into account landscape characteristics and the values (i.e. structures, infrastructure, special places) on the landscape. Steve Bassett of The Nature Conservancy has conducted this assessment and mapped the results to highlight where treatments such as thinning or prescribed burns are most necessary, and how intensive treatments must be to mitigate the wildfire risk. Steve will be at the TVCA meeting on May 7 to discuss the risk assessment model and to answer questions about the Fireshed Strategy. Local representatives from the U.S. Forest Service and the Pueblo of Tesuque will also be at the meeting to answer questions as well. National wildfire community preparedness day: are you prepared? Join the City of Santa Fe Fire Department on Sat., May 5th for National Wildfire Community Preparedness Day. What to expect in an Evacuation. Preparing for wildfire and the work of the Fireshed Coalition. Please park in the Visitor Parking or the handicapped spaces adjacent to the building. Join us for the third seminar in the Spring Seminar Series for Fireshed Awareness Season. This past winter was a sobering reminder of rising temperatures and increased incidence of drought. With the specter of longer and more intense fire seasons, it is urgent now more than ever to take concerted action to protect our forests, homes and watersheds. The Greater Santa Fe Fireshed Coalition in partnership with the City of Santa Fe Fire Department and the New Mexico Association of Counties brings you a Spring Seminar Series designed to bring awareness and action to these topics. The Spring Seminar Series is held at REI in Santa Fe. There will be time for discussion, questions and community announcements after each seminar. Each seminar will address a new topic and may integrate discussions or ideas from the previous topic. Download the flyer for a full list of seminars and visit our events page for more events like this. Join us on 4/26 to find out what you can do for your home and community to prepare in the event of a wildfire, and the work that the Fireshed Coalition has been been completing in the Santa Fe area. Join us for the second seminar in the Spring Seminar Series for Fireshed Awareness Season. Join us for the FREE community event on April 11th at The Lodge for a Fire Adapted Communities presentation, networking and a reception with a cash bar and provided hors d'oeuvres. Please RSVP if you plan on attending this event. More info on the 2018 Wildland Urban Fire Summit here. Join us for the first Seminar in the Spring Seminar Series for Fireshed Awareness Season. Coalition partner, Santa Fe Watershed Association, is hosting their 12th annual Santa Fe River Cleanup for Love your River Day on February 10th. Join us for hot cocoa, donuts, prizes and collective river clean up! Contact 505-820-1696 for more information or just show up at Frenchy's Field Barn at 10am on 2/10/18. Tesuque Public Meeting: What is our Fireshed? Ellis Margolis is a research ecologist at the USGS New Mexico Landscapes Field Station, based in Santa Fe. He received a Ph.D. in Watershed Management from the University of Arizona. Since joining the USGS in 2015, he has continued his research on the interactions between fire, forests, and climate and specializes in dendrochronology (the study of tree rings dating). Presently, his research focuses on land use and climate effects on fire regimes and forests of the southwestern U.S.
Join us to explore topics in your fireshed such as wildfire risk assessment, fire history, forest health, protecting your home and much more! Find out more about the butterflies and birds, wildflowers, rocks and geology on the Santa Fe National Forest (SFNF) on a nature walk with Forest Service staff and volunteer experts on Sunday, Sept. 17. Fireshed mountain bike and running tour: Bear Wallow to Borrego loop. Join the Forest Stewards Guild on a guided mountain bike and running tour through a section of the fireshed. The two groups, mountain bike and running, will meet up at the Bear Wallow trail head at 5:45pm and will leave the parking lot promptly at 6pm. Several stops will highlight the area's fire history. We won't distribute your information, this is for emergencies only. bring your bike, helmet and water. Moderate difficulty, some uphill on the lower Windsor trail required. No one left behind. Several stops at points of interest will highlight the area's fire history. Bring running attire and water. 4 mile loop. No one left behind. Several stops at points of interest will highlight the area's fire history. Join Krys Nystrom of the Wildfire Network, Jan-Willem Jansens of Ecotone Landscape Planning, and Zander Evans of the Forest Stewards Guild for a wildfire home hazard risk assessment training and tour of a woodland restoration project in the Wildland Urban Interface. The training will take place at a private residence and to limit parking issues we will be meeting at 9:45am the Atalaya Lower Trailhead parking lot off of Camino de Cruz Blanca in the St. John's College parking lot (see map below). Join us this Wednesday evening at REI in Santa Fe to learn about controlled burns and smoke management. Understand the role of fire in the ecosystem. Learn how controlled/ prescribed fire is implemented and find out how smoke is managed and mitigated during a controlled burn. Discuss with your peers and fire professionals the how and why behind controlled burns. 5:30 - 5:45 Opening remarks, what is the Greater Santa Fe Fireshed? How is prescribed fire implemented? Join us for a field trip into the Fireshed! Visit the site of recent pile burns near the city municipal watershed. Field trip led by the City of Santa Fe Fire Dept. Hiking required. Bring water and a jacket. TIME: 9-12 MEETING PLACE: You will receive an email when you RSVP with this information. The Wildland Urban Interface (WUI) Summit is a statewide conference that is organized by representatives from state and federal agencies and local non-profits. The WUI Summit is an opportunity for local leaders, emergency responders, businesses, and citizens to learn from each other and stay informed on current science and practices in mitigating risk of wildfires in the wildland urban interface. The 2017 WUI Summit will be in Albuquerque, New Mexico at the Sheraton Airport Hotel. This year, the conference will have three concurrent tracks that focus on the technical, "How does it work? ", collaboration, "Who can I work with? ", and action, "What can I do?". There will also be two field trips: One will visit the northern bosque in Corrales and Rio Rancho, and the other will visit East Mountains. Saturday is a free family-friendly half day where the general public can learn and engage. Every other Wednesday starting on March 14th - April 26th there will be an evening seminar held from 5:30 - 7 at REI in Santa Fe that focuses on topics affecting our fireshed. Speakers will address issues such as, the impacts a wildfire would have on economy, culture and tourism; what does it mean to restore a forest; the role of fire in the forest ecosystem; smoke management; programs available that will help you reduce your risk from wildfire, and much more. There will be time for discussion, questions and community announcements after each seminar. Santa Fe, NM – The City of Santa Fe Fire Department and The Forest Stewards Guild are convening a prescribed pile burn on city land near the municipal watershed in January 2017 weather dependent. The burn will be contingent on wind, relative humidity, temperature, and expected weather patterns. This work is part of the Fire Department’s mission to reduce risk to lives and property from wildfire. It is also part of The Nature Conservancy’s Fire Learning Network (http://goo.gl/cJwjBh) and the Fire Adapted Community Learning Network (https://fireadaptednetwork.org/) and is within the larger Greater Santa Fe Fireshed, designed to promote fire adapted communities and reduce wildfire risk. Pile burning is often part of reducing hazardous fuels and is needed to reduce the heat, intensity, and spread of a future potential wildfire. Firefighter and community safety is the top priority for the burn. The burn will use experienced and qualified firefighters. The team will follow an approved burn plan, comply with New Mexico Air Quality Bureau smoke management guidelines, and have wildland firefighting equipment on-site. Smoke will be visible and may settle into surrounding area at night but should disperse the following day. The team will work to minimize smoke impacts to communities by visually monitoring smoke. Landowners interested in learning more about the Fire Adapted Communities can visit www.fireadaptednm.org, a website designed by the Forest Stewards Guild and Fire Service Support LLC for the New Mexico Hub of the Fire Adapted Communities Learning Network. During the burn period, information regarding the project can be obtained by calling 505-231-3163 or visiting http://www.santafefireshed.org/events/ .